BP wants Prime Minister David Cameron to intervene over the escalating cost of compensating US companies for the Gulf of Mexico oil disaster in 2010. BBC business editor Robert Peston has learned that BP feels its financial recovery is in jeopardy because the compensation system is being abused. The financial burden of paying fictitious and inflated claims may even make BP a takeover target, it fears. 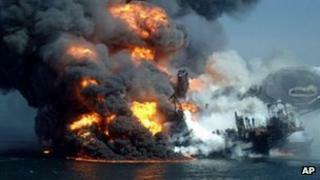 BP hopes Mr Cameron will raise the issue with the US government. The Deepwater Horizon disaster killed 11 oil rig workers and released an estimated four million barrels of oil into the Gulf and along the coastline. BP put aside $7.8bn (£5.2bn) when it agreed to pay compensation in 2012, but the company now expects the final figure to be much higher. Our business editor said: "According to BP sources, the rate at which cash is leaking from the company could turn into a serious new financial crisis for the company, putting at risk its dividend and making it vulnerable to a takeover by another oil company. "BP is so worried by the potential magnitude of alleged undeserved payments it is making to companies that it is planning to ask the UK prime minister and chancellor for help in persuading the US government to intervene. "It is hopeful that David Cameron will raise the issue at the G8 meeting of the government of the world's richest countries, which the UK is hosting next month." The company is also under pressure, along with other oil majors including Shell and Norway's Statoil, following allegations that firms colluded in fixing oil prices. David Cameron said he was "hugely concerned" about that situation. Last year, BP agreed to pay compensation to around 100,000 people and companies, including fishermen and restaurant owners, who claimed their livelihoods and health had been affected. However, BP feels that the court-approved rules under which "business economic loss" is assessed are being systematically abused. "In practice, according to BP, [these] companies don't have to show a fall in profits as measured on normal accounting practices," according to Mr Peston. "All they have to show, says the court filing, is that cash flow in a specified month or months is lower than cash flow in the same month or months before the oil spill," he wrote in his blog on the BBC News website. BP is still engaged in court action in the US over fines and other potential spill liabilities, but agreed a deal last year with a range of compensation claimants, including businesses. Media captionMalcolm Bracken, oil analyst: "They've written a blank cheque"
Malcolm Bracken, oil analyst from stockbrokers Redmayne Bentley, told BBC Radio 4's Today programme that the company failed to see the consequences of the settlement when it originally set aside the provisions. "You can argue it is being abused, but that was the settlement they made and they are trying to wriggle out of it." In March, BP began legal action in the US to limit payments by the fund set up to compensate those affected by the disaster. However, our business editor says that BP executives believe that even if it wins the appeal, the final cost of compensating firms will still be "significantly" higher than the amount it has set aside.